Some of my favorite parts of fandom, gaming and pop culture have been critiqued by a vocal but all too defining minority. Things I really don’t need to hear or have implied include “Women are ruining fandom!” “Diversity will mean quotas and lower standards!” “Where are the young people? Fandom is dying because they don’t support my parties and why don’t they laugh along with my friend’s sexual harassment?” “Complaining about bigotry, bullying or systemic issues will destroy what is good and is off topic anyway.” “The wrong things have popular appeal and $60 is too easy a threshold for voting rights and it could ruin everything! Why, voting might get as cheap as $20 if we are not eternally vigilant!” … Cause we all carelessly throw around that kind of money… And so on, ad nauseum. I don’t like it when incredible people I know are misrepresented, under represented, and sometimes you just have to celebrate your awesome-sauce. Cheryl Morgan was called a menace to fandom because she created the fanzine Emerald City (1995-2006), which existed in digital and well as print. How dare a science fiction fanzine use something as science fictional as the internet? It just wasn’t fair! Cheryl designed badge ribbons in emerald and gold that proudly proclaimed menace to fandom. 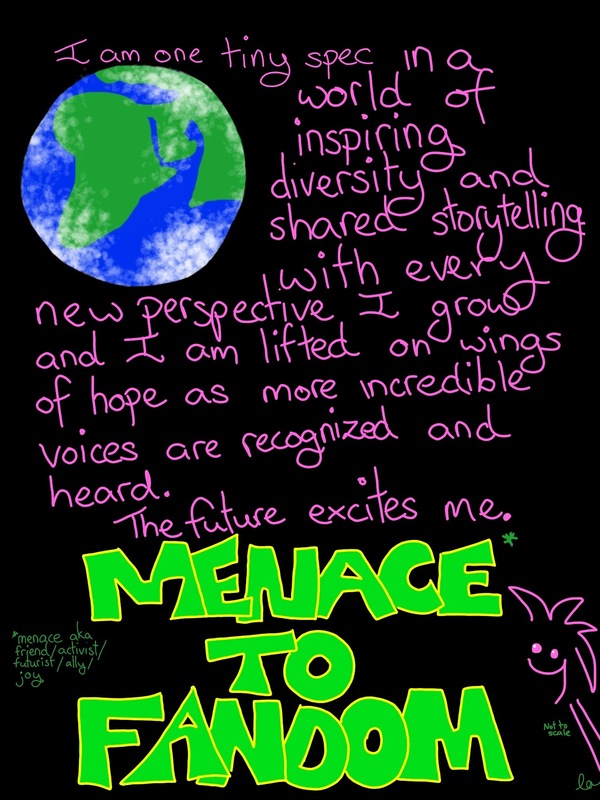 Recent controversies have made quite a few of us want to wear a menace to fandom ribbon, given menace reflects people, issues and activism that make our communities of practice a better place to be. A place that dreams of a complex future and likes seeing a more complex past. I don’t have a ribbon, but this is possibly the first piece of fan art inspired by a ribbon. 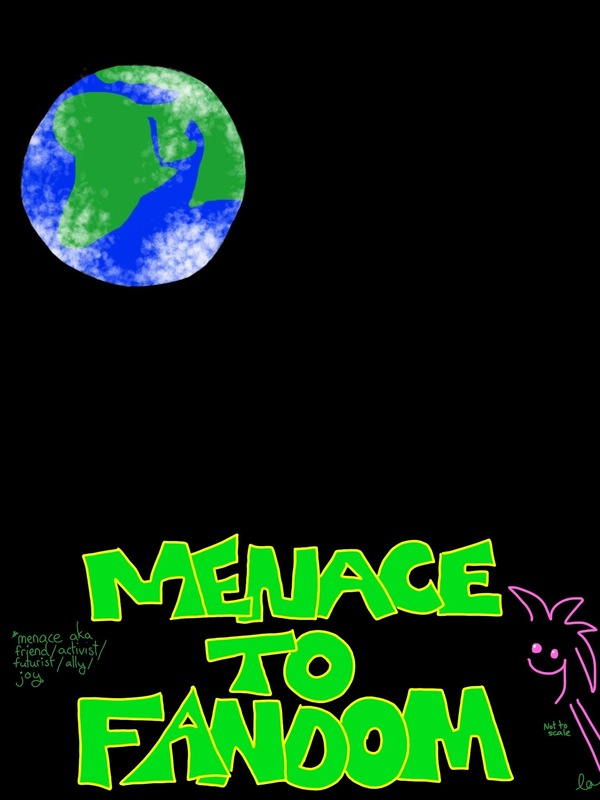 I have also created a blank version, so you can write your own menace statement and wave your manage flag high. I’ve written a few definitions of menace, but there’s also space to write your own.